Several parties filed an appeal recently in the D.C. Circuit challenging the Federal Energy Regulatory Commission’s (FERC) approval of the Atlantic Coast Pipeline (ACP). The ACP, a 600-mile, $7.5 billion (and counting) project slated for West Virginia, Virginia, and North Carolina, is controversial for lots of reasons: it’s a duplicative project that is not needed to meet energy demands, it would cross and permanently alter national treasures, such as the Appalachian Trail, and Dominion and Duke Energy are trampling on private property owners’ rights. Tragically, the ACP is also an example of FERC’s facilitation of environmental injustice. NRDC and an extensive group of environmental, civil rights, faith-based, and other organizations and initiatives filed a brief with the court on Friday highlighting how FERC’s analysis of the ACP failed communities of color in Virginia and North Carolina. Federal law requires that federal agencies undertaking environmental justice reviews account for impacted minority communities and prevent inequitable environmental outcomes. But FERC’s methodology largely overlooked their existence and, as a direct result, prevented FERC from analyzing the ACP’s adverse and disproportionate effects on communities of color. FERC’s approach—reliance on census tract data—is prone to undercounting environmental justice communities. This is because census tracts vary wildly in population and area. In densely populated areas, census tracts may act as a good proxy for the community in the immediate vicinity of a pipeline, but in rural communities, census tracts often cover hundreds of square miles and combine vastly different communities in terms of wealth and racial makeup. Communities of color located near a pipeline, but buried within a large, whiter, sparsely populated census tract, are missed. EPA has warned against relying on census tracts in environmental justice reviews for this very reason. Yet that is exactly what FERC did for the ACP. A prominent example is FERC’s confounding determination that there are no minority environmental justice communities near the planned pipeline compressor station in Buckingham County, Virginia, Compressor Station 2. This is despite the fact that Compressor Station 2 would be located in the historic majority African American Union Hill community, a community founded by freed slaves. Household surveys showed that of the residents closest to planned Compressor Station 2, approximately 74 percent identify as African American. FERC’s flawed methodology did not reflect this reality. Instead, it defined the three census tracts within a mile of the ACP (only two of which are within a mile of the Compressor Station 2 site), totaling almost 500 square miles, as the potentially affected area. Because Union Hill is contained within these larger, whiter, sparsely populated census tracts, Union Hill was erased. This was not the only way in which FERC sliced and diced communities of color. To determine whether a minority population was an environmental justice community, FERC looked to whether the population was “meaningfully greater” (arbitrarily defined as ten percentage points higher) than the county average. This metric for concluding an environmental justice community exists has at least two analytical problems. First, using the county as the reference population (as opposed to something larger, like the state) means that FERC applied a shifting baseline (eight for North Carolina and ten for Virginia) to determine whether a community counted as a “minority environmental justice community.” Similarly sized minority populations were both included and excluded from classification based purely on the county in which they were located. Second, it fails to account for the fact that, especially in rural areas, census tracts encompass large enough percentages of the county population as to make the comparison between census tracts and counties irrelevant. 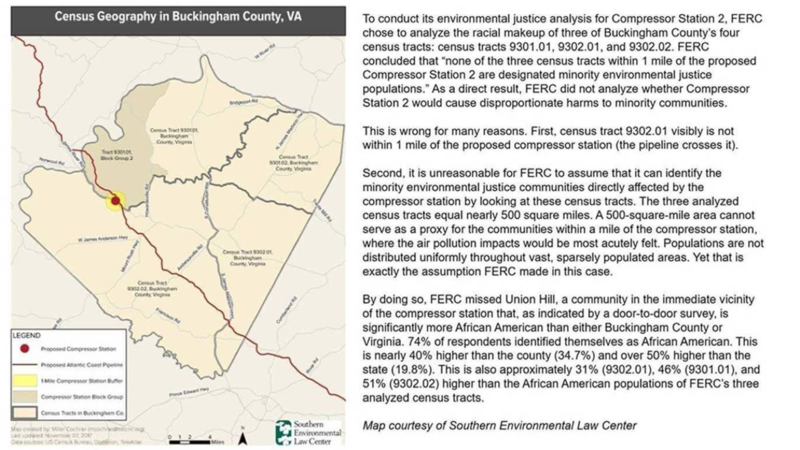 For example, none of the three census tracts FERC analyzed regarding Compressor Station 2 had minority populations “meaningfully greater” than Buckingham County. This is no surprise because Buckingham County has only four census tracts. Thus, it makes sense that each census tract would not dramatically differ in racial makeup than the county average. Additionally, FERC lumped all “minorities” together, such that unique minority communities who represent proportionately small percentages of the overall population were ignored. A staggering 25 percent of North Carolina’s American Indians live along the ACP route. But because the American Indians near the pipeline route proportionately constitute a small population (approximately 50,000 live in Robeson County and approximately 30,000 live in FERC’s defined study area), FERC offered no analysis of the effects of the ACP on American Indians. Tribal governments and scientists informed FERC that American Indian populations were being masked by FERC’s methodology, but the agency did nothing. Why does FERC’s shortchanging of affected communities of color matter? Because FERC failed to identify these communities of color, it did not analyze the unique health and environmental risks they face from the ACP, including the known risks of compressor stations. The pollutants emitted by compressor stations can exacerbate existing health issues that are already disproportionately present in minority communities. For example, as the NAACP has found, polluting infrastructure is already unduly located in African American communities. Many of the pollutants emitted from compressor stations, for example, can trigger asthma attacks and asthma is already more prevalent in African American communities. Many of the pollutants from gas infrastructure also present cancer risks, and cancer is also already more prevalent in African American communities. Further increases in cancer-related pollutants could have disproportionately high and adverse effects on these already vulnerable populations. If FERC fails to identify the population, though, it cannot analyze these effects. Even when FERC did identify a minority environmental justice community, such as the 75 percent African American community where the planned compressor station site in Northampton County, North Carolina will be located—FERC still failed to conduct a rigorous analysis, and instead minimized the health effects of the pipeline’s infrastructure, stating that the air pollution would not exceed legal limits. But this observation’s logic fails to hold up to minimal scrutiny. If meeting the legal limits for air pollution was sufficient, there would be no need to conduct any analysis, since a facility that cannot meet the legal limit cannot be built. Further, the legal air pollution limit is not a proxy for the impact of the compressor station’s emissions on the community. Indeed, EPA has found that such pollutants present risks—at any level. While this analysis is disconnected from reality, it presents real life adverse consequences. The grave reality is that Northampton County already has an elevated cancer rate, which is higher than the state average, as the NAACP has found. In particular, lung and bronchial cancers, associated with air pollution, are elevated. Northampton County residents also have higher rates of asthma compared to the rest of the state. And now they could be stuck with a polluting compressor station, because FERC did not rigorously analyze its effects. In the first instance, FERC’s gerrymandered analysis led to the erasure of communities of color, which led to it not analyzing the ACP’s unique effect on these communities, which led to its faulty conclusion that the ACP would have no disproportionately high and adverse impacts on African American communities. Then when FERC did acknowledge the existence of a minority environmental justice community, its striking disregard of the clear health risks to the community amounted to the same erroneous conclusion of no impact. In each case, FERC’s flawed analysis helped produce FERC’s faulty approval of the project. This is what environmental injustice looks like. Concerns about environmental justice have been raised before at FERC, and many, including NRDC, have called for FERC to reform its environmental justice analysis, to ensure that it captures the true effects of pipeline projects on environmental justice communities. It is soberingly clear how and why polluting fossil fuel infrastructure is disproportionately placed in communities of color, and FERC’s permissive and inappropriate approach to reviewing these projects facilitates this environmental injustice. The D.C. Circuit can prevent imminent harm to environmental justice communities along the ACP path by vacating FERC’s undue approval of the ACP. Alternatively, the court could remand the case back to FERC for a real analysis that is consistent with the law’s requirements. Such an analysis would not obscure the facts. It would recognize environmental justice communities and the threats they face. It would reveal the disproportionate burden the ACP would have on vulnerable communities. It would thoroughly review project alternatives. It would demonstrate that environmental justice communities matter. As part of a fulsome public interest analysis, a reasoned environmental justice review would further demonstrate what is already known: that the ACP is not needed, is environmentally unjust, would cause permanent environmental damage, and should be rejected.